Post pallets are widely used within the warehousing industry. They offer a range of benefits to warehousing teams when storing and transporting goods. In our latest article, we take a look at a few of the main benefits offered when choosing post pallet stillages for your project. To order post pallets from Range Storage Equipment, contact us on 01274 736 363 or drop us an email. What is a Post Pallet? A post pallet is a stackable storage pallet, suitable for storage and transportation. The pallet base is flanked by a certain number of posts, making it easy to stack, particularly in a warehousing environment. Post pallets feature a ‘cupped’ feet design and are typically made of steel. Post pallets can vary in size, depending on the needs of the customer. Some post pallets have removable posts to further add to the ease of storage. 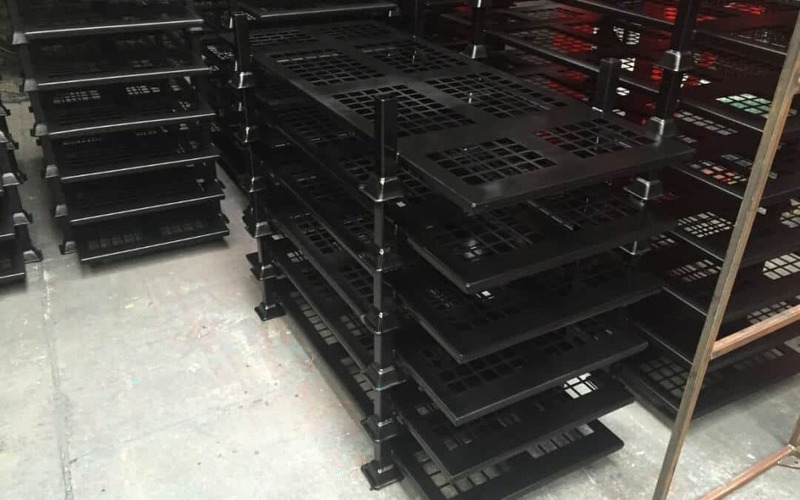 One of the major benefits of using post pallets for storage is that they are one of the most cost-effective stillage options available. Made with sturdy metal and reinforced with a central bar, post pallets are extremely durable. This means that when you buy post pallets, they will last longer than other types of stillages. So, you can be sure that you are getting great value for money with our range of post pallets. Another great thing about post pallets is that they can be used to store a huge range of products. Unlike wooden pallets, post pallets have the strength to withstand greater weights, making them suitable for storing and transporting heavy goods. They can be manufactured in several different specifications, with different materials, sizing and number of posts. We currently produce post pallets with either four, six or eight pull out posts. Our post pallets are available with an open base, a steel plate base or a mesh base, depending on your requirements. Post pallets are brilliant for space saving. Our post pallets come with demountable legs and stackable feet, making them much more effective for storage. Choose post pallets for an easier, safer storage solution. This makes them ideal for warehousing, especially where space is limited. Post pallets are quick and easy to put together and are great as a temporary storage option as well as for longer term storage. Thanks to our in-house 3D+ modelling computer system, we can create reliable and durable metal post pallets to meet your exact requirements. Our post pallets are used across a variety of different industries as they are so useful and can meet all your storage needs. If you require a bespoke post pallet order, simple contact a member of our friendly team who can advise you and provide you with a detailed quote. Why Choose Range Storage Equipment? We are one of the UK’s leading post pallet manufacturers, providing a high standard of service to all our clients and offering quality products that are expertly designed and built to last. Over the last 35 years, we have manufactured almost half a million stillages. We can create bespoke designs as needed to meet the requirements of our valued customers. When you work with Range Storage Equipment, you are guaranteed to see quality workmanship from a company that is ISO 9001 accredited. We use state of the art equipment and the latest techniques to make our pallets and stillages the best in the industry. Get in touch today to place an order or to learn more about our services. Call today on 01274 736 363. Interested in the benefits of wire mesh metal pallets? Visit our blog. Laurence is a content writer and marketing manager for Range Storage Equipment Ltd. He helps publish regular content and insights for customers and industry personnel. How Much Money Can Steel Stillages Save Your Business? Range Storage Equipment Ltd manufacture a whole range of products.